Here's a face that not even a mother could love - as evidenced by the fact that she tried to kill him the first time they met. Little is known of the monster called Validus. He was originally genetically engineered specifically to combat a Sun-Eater, but ended up turning his abilities to more criminal interests. He acted as a member of the Fatal Five, and fought the Legion of Superheroes. That's the post-Crisis Validus, by the way, because that's what this figure represents. The pre-Crisis Validus was actually the son of two of the Legionaires, stolen by Darkseid, mutated, and sent into the past so he'd be a threat before his parents ever knew who he was. So like the whole deal with Scott and Jean, Apocalypse, and Cable. 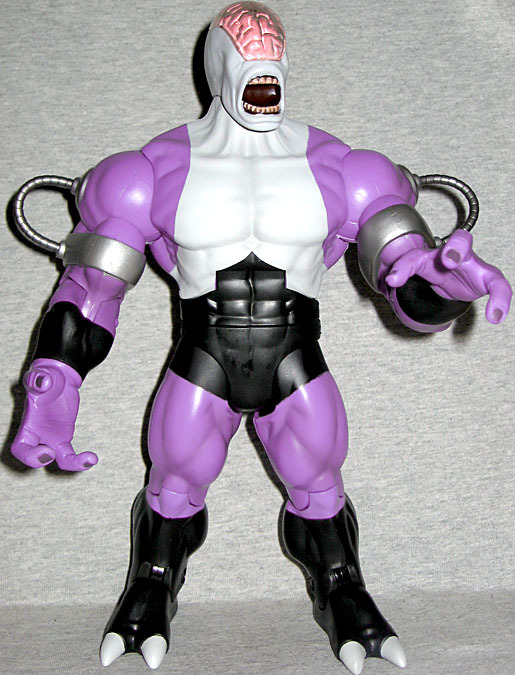 Validus is the BAF for DC Universe Classics Series 15, and may be the cheapest one ever. See, in their desperate bid to stay relevant in the toy world, Kmart struck a deal with Mattel to be the first store to carry DCUC15: they got the figures early (October 24), with stickers proclaiming their semi-exclusivity, and for the first week sold them at the low price of $7.75 in honor of DC's 75th Anniversary; National Allied Publications, the company that became DC, put out its first book in the fall of 1934. Validus is a big figure, standing 9⅜" tall. But unlike Arkillo and Kilowog, he's not too big: Validus is a giant character, towering over the heroes he fights. Heck, some sources list him as 15' tall, so if anything he's too small. He's almost in 4" scale. We're not going to be the ones to complain about that, though, because he's still big. 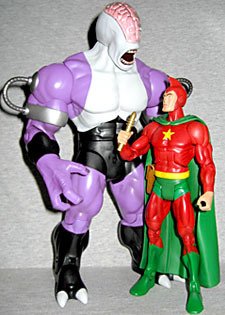 He still looms over any other DCUC figures you put near him, which will be good news once that LoSH set comes out - right now the only 31st century character we have is Tyr, and he's more likely to be on the same side as Validus, not fighting against him. The base of this figure's sculpt is the same as Arkillo, Kilowog and Brimstone, but there are definite differences. The hands and feet, obviously, but also the upper arms and shoulders, which have sculpted discs and bands and fancy tubes running between them. In the comics, those "tubes" run flat against the arm, but that wouldn't have worked too well on an articulated figure, would it? The chest is also new, in that it has no additional embellishments: no collars, no wrinkly skin, no permanently attached head, nothing. This is the first time a figure based on this body has had a vanilla torso sculpt. Validus's defining feature is that he doesn't really have any defining features - he has a mouth, but no eyes or nose. The remainder of his head is dominated by a large, exposed brain beneath a tight glass dome. Both the dome and the brain beneath it appear to have been sculpted - it's not just a case of one or the other, but both working in concert to make the wrinkles more prominent without being unnaturally deep. 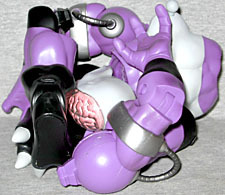 The head is narrower than you might expect, but the way the brainy top part bulges out slightly at the sides is accurate to the comics. The paint is good, and what pegs this as the post-Crisis Validus rather than the vintage version. Validus originally had black arrows on his arms, and wore lime green undies - other than that, the various Validuses are nigh identical. The purple used for his skin is a nice shade, and rather than being pure white, the paint on his head and torso is a pale gray. Articulation is standard: balljointed head, hinged neck, swivel/hinge shoulders, hinged elbows and torso, swivel wrists and waist, swivel hips, hinged knees, and hinged/rocker ankles. The tubes on the shoulders don't take away any motion at all, because the arms move just as far as they would if the tubes were unplugged. Validus is a very nice Build-A-Figure, even if you've never heard of the character. Yes, he's a villain for the Legion of Superheroes, but since approximately five fourths of all LoSH stories invlove them interacting with modern heroes via time travel (in either direction), does that really matter? He's close to being the right size, he has a cool visual, and it's a character who hasn't had an action figure before. Now, when can we get some more of the Fatal Five?